As the snow finally disappears and the weather warms, it signals the beginning of golf and, unfortunately, allergy season. 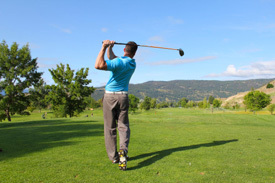 Whether you are an active member in a league, play for fun with your spouse, or play once a year at the annual company outing, it is important to remember golf is a demanding sport. I enjoy it, but unfortunately do not frequently play. However, I have seen what it can do to people first hand. Several family members are active in evening and weekend leagues, including my mother and grandmother. Shoulder impingement, rotator cuff strains, low back pain, wrist problems, and elbow issues frequently occur for golfers. Most of these tend to be overuse injuries caused by the mechanics of swinging, not warming up properly, or taking the necessary steps for an appropriate cool down. Two of the more common injuries that we see in the office are shoulder impingement and low back pain. Shoulder impingement arises when the musculature of the rotator cuff becomes compressed and inflamed. This often leads to muscle injuries, joint dysfunction, and pain. Low back problems regularly occur from bending, twisting, walking and straining weak areas of the body. Golf demands the synergistic work of numerous muscle groups and joints as well as proper mechanics. We work with seasoned and novice golfers to improve their stretching routines, muscle tone, and joint function. We also utilize specialized taping techniques known as kinesiotaping, perform adjustments to the affected joints, and utilize physical modalities such as ultrasound and muscle stimulation, if necessary. Aside from the occasional golf injury, comes the ever-dreaded seasonal allergies. Whatever your particular trigger: pollen, ragweed, or fresh grass, you are not alone as it affects millions of Americans annually. As someone who has suffered with this since childhood, it can be a difficult time. The itchy eyes, runny/stuffy nose, and the throbbing headaches often make everyday life miserable. Allergies are the body’s overblown response to common environmental factors. As for our role, adjustments and sinus work by our chiropractic team has yielded wonderful results, helping individuals manage and reduce their symptoms. Also, something that I do that has helped me with my allergies: incorporate locally produced honey into your diet. It must be within your general area as bees pollinate those flowers and buds that often make you sneeze. This will help your immune system to respond more appropriately to allergens if and when you are affected. (Note: infants and children under 1 should not ingest honey.) So, whether you are an avid golfer or an allergy sufferer, know that we are here to help you.